Imaging the River, at The Hudson River Museum in Yonkers, weaves together the areas rich history of landscape painting and contemporary artists conceptions, responses, and visions of the current state of the river and its future. The river emerges from the exhibit as a significant intersection of American industrialization and expansion and an important natural resource. Informing and transforming our perceptions of the Hudson River and its environs, the exhibit includes a variety of approaches; sparkling sedimentary drawings, video celebrations of the light, the flow, and the composition of the river, as well as photographic and painted commentary on the pollution and over development of the river valley. Guest curator Amy Lipton, of ecoartspace in Beacon, New York, says, All of the artists in Imaging the River share a common desire to make their particular experiences a part of the rivers continuum. The blend of century-old work and very recent work reveals the rich territory artists explore when inspired by our natural environment. Media in the exhibit include painting, sculpture, photography, drawing, video, digital work, and multi-disciplinary work. Throughout the exhibit, materials are interwoven with the river, letting the river speak for itself. In areas of the show, the joy is in the observation of landscapes, their compositions and the passage of time. The concept of observation and recording nature in various media is directly tied to the Hudson River School of landscape painting, of which the Hudson River Museum boasts an extensive collection. Examples from the Hudson River School in the current exhibit such as paintings by James Renwick Brevoort, Herman Fuechsell, and Bayard H. Tyler celebrate the value of actually experiencing nature. An example by Jasper Cropsey incorporates signs of industrialization, but at this point in history it seems a balance and peace exists there. Contemporary participating artists such as Larry Frankel, Susan Jennings, and Colin Barclay echo this celebration of the experience of landscape. Other artists focus on observing and recording the intersection of society and environment. For example, Dan Ford juxtaposes a Hudson Valley School-like landscape and 21st-century commercial images of a soda can and fast food restaurant. The effect is comical, but also makes its point. Some artists with this focus use darker images. As military maps visually target key sites for destruction, Bob Braines Mid Hudson Formation, 2003 presents four areas along the Hudson River disturbed by industrialization and urban sprawl that could be targets for clean up or reclamation. Braines works combine maps, elevations, longitude and latitude locations, and marks indicating the direction of wind from dead areas towards the river. We hardly need the skull and crossbones to convey the impact. Renata Rainers black and white photo Mirage 2003, superimposes a nuclear plant on the sails of an antique-looking vessel sailing down the river. Video artist Alex Michelsons eloquent projection Twilight, Indian Point features a picturesque, calm view of a nuclear plant. Jaime Davidovichs Hudson River as Red Sea video installation takes on an additional metaphor, as its images were taken from the 91st floor of the World Trade Tower during a residency in 2000. Davidovich used a series of gels and glass to filter, soften, and make intimate zoomed-in moments of activity on the river. Several artists have a scientific and research-based approach to their commentary on the Hudson River. These artists use water and sediment samples, maps, and text to inform their audience. The rivers physical properties emerge, and then are submerged into the artworks aesthetic. A highlight of the exhibit is Sandy Gellis Hudson River Drawings, Month of May: 1994, 1995 which elegantly connects water samples, a scientific-like process of adding elements to each water sample, then lets the resulting liquid drip onto her paper, producing gestural wave-like drawings. Gellis, like Raquel Rabinovich, uses the river as her material. Rabinovichs Liquid Library is made from handmade paper soaked in water and sediment from the Hudson and Ganges Rivers, and is displayed as archival material documenting the repetitive process of sedimentary deposits. Basia Irland has a history of collecting water samples from all over the world. Her Poem for Yemanja of 1988 displays her personalized collection of labeled and bottled waters as momentos, memoirs, or offerings on an antique laboratory-type wood shelf. Ann Rosenthal and Steffi Domikes River Vernacular combines a map of the river, postcards (with stamps, informative text, and anecdotes) from specific spots on the river, and delicate veils of cloth hanging which had been dipped in the river at the same specific locations. The work connects stories of social interactions with the effects of industrialization and expansion on the Hudson River Valley. The antique-looking postcards serve as journal-like memoirs and as an inspired communication tool for expressing the sense of loss and the observation of change. Imaging the River offers, in addition, a platform for an activist approach to expressing the relationship between the river and the encroaching humanity. As Amy Lipton says, these artists are advocates for environmental awareness and community activism. They argue for transformation and a collective awakening about our ideas concerning land use and landscape. There is a warning from Alexis Rockman in his Fishing in the Hudson, a digital print from his River Keeper 2001 project, in which he portrays a mother, son, and unborn child who have been contaminated by PCBs from eating fish from the Hudson River. Part of an activist project, this and other posters were displayed on billboards, bus shelters, and phone booths around New York City. Helen and Newton Harrison created On the Hudson River Drainage Basin: The Forests: First Sketch- On Woods and Water for the exhibit that proposes a Long Trail conservation area linking the various woodlands along the river. Their work interconnects US Geological Survey maps, satellite imagery, and scientific poetry, describing the process of discovery of facts about the Hudson River and the forestlands along it. Aviva Rahmani composes a multi-disciplinary symphony for the river in her Through A Glass Darkly, Dedicated to the Memory of Sara Rahmani, by playing video river moments off a parking lot approach ramp, and harmonizing with landscape paintings and an audio component. The work demonstrates how our view of the Hudson is blocked by so many physical and philosophical obstructions. The challenge is in finding the view. This intriguing and informative exhibit is a meaningful bridge between the Hudson River School collection at the museum, and the new Riverama interactive and scientific exhibit there. The work as a group inspires appreciation of the remaining undisturbed landscapes and provokes further questioning about what we as a society can and should do to preserve these landscapes. This collection of artists demonstrate how closely tied are the worlds of science, art, and philosophy. 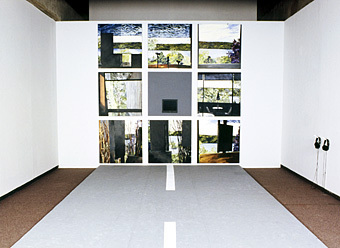 The exhibit is as Amy Lipton, referring to the use of mapping in several of the works, says, more than just a means for exploration, but also a way to re-vision the landscape, pointing towards potentially new ways of seeing the world. Imaging the River is worth the trip to a museum that deserves more visibility. Cynthia Robinson is a visual artist working in the environmental/ecological art realm. She is currently enrolled in the MFA in Visual Art Program at the Union Institute's Vermont College.